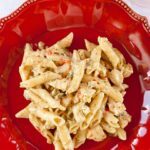 Savory Slow Cooker Cajun Chicken Alfredo. Packed with wonderful flavors! Cover the chicken with the Cajun seasoning. Add the rest of the ingredients EXCEPT the Penne Noodles. After about 2.5 hours, check the chicken. If it is cooked, take the chicken out and cut into bite sized chunks and place back into the slow cooker. Add the Penne noodles at this time. Once the Penne noodles are fully cooked, it is time to serve! Important Tip: Yes, there is enough liquid in the recipe to cook the pasta. However, you will need to keep an eye on the pasta and stir it around. Once the pasta is done and the sauce is to the thickness you like, turn off the slow cooker or turn to “keep warm”. You do not want to burn the noodles.